It’s 6:12am. You are half-sitting in bed scrolling through social media, trying not to make a sound, because you know this may be the last peaceful moment you get today. Your mind is already swimming with the overwhelming to do list and the things that didn’t get done yesterday. You’re planning the time it’s going to take to get everyone dressed and out the door, and wishing that cup of coffee would just make itself. And that, dear mama, is the beauty and power of a PM routine. Imagine waking up knowing you had already set yourself up for success? It’s easier than it sounds. And it is a game changer! I know what it’s like to feel like falling into bed the moment the kiddos are asleep. You’re out of steam and craving some much needed rest. So if 5 steps feels like a little too much to take on right now, I encourage you to try implementing these one at a time. I promise they are worth every exhausted minute in their morning payoff. Each night after dinner, close the kitchen for the night. If your kiddos aren’t able to help with this one, this can happen while your spouse is handling bath time, or if you’re on your own for bath time, then after the kiddos are in bed. Get every last dish into the dishwasher and start the machine. Wash any hand-wash items, dry and put them away, or leave them to air-dry overnight. Make the coffee. Set the timer so you can wake up to the smell of freshly-brewed coffee. Consider it a gift to your future self! My toddler loves to help with this and enjoys seeing me drinking coffee the next morning that he helped to make. Take item(s) out of the freezer for tomorrow’s dinner and move to the fridge. Wipe down the counters, cabinet fronts and the sink. Declare the kitchen closed for the night! You have just given yourself a fresh start for tomorrow. If anyone attempts to venture into the kitchen after that point, offer them a menacing stinkeye and a bottled water from the garage. I’m kidding…. kind of. Before you go to bed, review what is on the calendar for tomorrow. Where do you need to go? What are your must-do items and what items or information do you need to accomplish them? Write a list. Check the weather forecast as well to avoid any surprises or to give you a heads up for possible last-minute cancellations or changes of plan due to weather. The very act of completing this review will allow you to wake up with a sense of direction, knowing what you’ve already decided to focus your efforts on. It will also help you to pull together any supplies you need for tomorrow’ activities. This is an easy one, but it will save you a ton of hassle! Set out something to wear tomorrow so you don’t have to think about it when you’re in action mode tomorrow. Check that there are no surprise repairs, washing or ironing to thwart your effort in the morning. Figure out accessories, jacket, etc as well and have them ready to go. Technically, you don’t have to wait until evening for this one. You can do this as soon as you return home for the day and count it done before it even gets dark outside. Prep anything you’ll need to help you get out the door tomorrow, whether it’s packing the stroller with earbuds, bottled water and a blanket, or the diaper bag or your purse. Prep the diaper bag: Empty it, wipe it down inside and out, and refill with diapers, wipes, and change(s) of clothing, ziploc(s) for wet or soiled items, snack items, water bottles, etc. If your diaper bag is also your purse, make sure you also have your sunglasses, wallet, and whatever other personal items you need (I keep mints and a lip gloss in mine at all times!). And here is the important thing: stage them by the door, or better yet, put as much as you can in the car now! If your car is not parked securely, you’ll obviously want to be cautious of what you leave in it overnight. Wash your face, brush and floss, and moisturize your hands and tired feet. Even better, indulge in a bubble bath or hot shower with your favorite fragranced soap. Read something inspiring or spiritually filling. If journaling is a good outlet for you, take a few minutes to journal your thoughts. Pray. For tomorrow, for your spouse, for your babies, for your loved ones. For direction and for patience and for whatever is on your heart. For forgiveness and surrender and a clean slate for tomorrow. Close out the day. I learned this from my sister Melissa, and there is so much wisdom in it! Closing out your day is where you mentally (and if needed, verbally) go through your day and release the things that didn’t go well. You can’t change the past! We moms are our own worst critics. Our children see us in our best moments and our worst moments. When we don’t get it right, we often mentally replay our failures over and over again, wishing we had done better. By closing out our mental balance sheet, we are releasing ourselves from the mental debt of unfinished business, failures, embarrassments and mistakes, and freeing ourselves from the self-doubt, fear, shame and negative self-talk that we as women often wage war against ourselves with. – are ready for what tomorrow will bring. Ready to start waking up to more peaceful mornings? I encourage you to implement one of these steps and keep at it for a week. Next week, pick another step, and begin to stack these habits until they are routine. These are easy practices to implement, and they prepare us for a successful morning, even amidst the demands of the day. When we do them consistently, they are life changing habits! I really appreciate these suggestions. Thanks so much for sharing them. 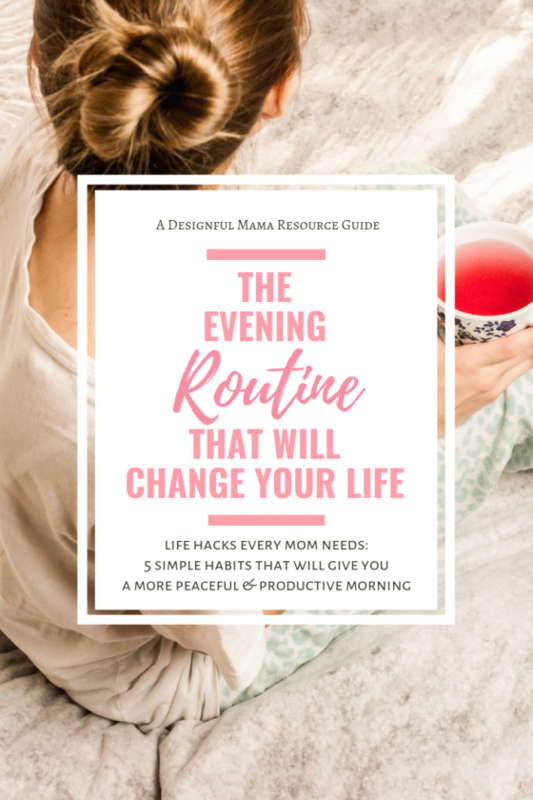 I’ve been telling myself for weeks that my mornings aren’t going well because I need a better evening routine! Thank you for the feedback Sheree! I hope you find these tips help your mornings as much as they have helped mine!